A very interesting bit of reading here on the beliefs and hopes of the Alphadelphia Association. Report of the Committee on Incorporations. The committee on banks and incorporations to whom was referred sundry petitions of citizens of the county of Oakland and other counties, praying for the incorporation of the Alphadelphia association have had the same under consideration, and in answer to the prayer of the petitioners prepared the accompanying bill which they now ask leave to introduce. 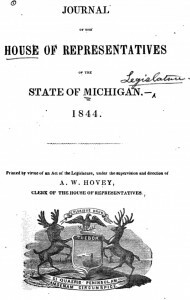 The plans and objects of such an association were fully staled by the president of the association to your committee, and to enable the association to carry out those plans, your committee believe an act of incorporation necessary, and for the reasons why the bill should receive the favorable consideration of the legislature, the committee would respectfully refer to the reasons set forth in the following letter, addressed to your committee by Doct. Henry R. Schetterly, president of the association. To the Hon. W. W. Murphy, Esq., Chairman of the Committee on Banks and Incorporations. Sir—At the request of your honorable committee, I embrace this opportunity of presenting to you the object and plans of the Alphadelphia association, and a few of the reasons why the honorable, the Senate and House of Representatives, ought to grant to it an act of incorporation. The plan of organizing joint stock industrial associations is new, and but little understood in this country. The theory was discovered by Charles Fourier, a Frenchman, whose name is spread on the pages of many of the journals of the arts and sciences to which he contributed, in almost every part of Europe, having been a member of many learned societies on the eastern continent. He died in 1837, without seeing a single association organized on his darling plan, to the investigation of which he had devoted the last twenty years of his active life. The first joint stock association was organized in France, in 1839, by a nobleman who purchased and stocked a farm, on which he employed three hundred poor laborers, and realized 4 and 1/2 per cent on his investments, besides nearly forty dollars clear gain to every laborer, after all expenses for repairs, boarding and clothing had been deducted; and in 1842 seven per cent on the capital, and seventy-nine dollars to each laborer was realized, clear of all expense. But this is merely an agricultural association, and the dividends can evidently never equal those of an association, in which every pursuit is carried on, at the same time, and the income runs together from many different sources into one great reservoir. In 1841 Mr. Brisbane, one of Fourier’s pupils, returned from France and soon published his social system; and the editor of the Tribune, (published in the city of New York,) has, during the last eighteen months, admitted essays on this subject into its columns, weekly.— There are now published in Paris and London, daily papers devoted exclusively to this subject; and a large monthly periodical, soon to be made a weekly, called the Phalanx, has been lately issued from the press in Now York. There are now ten or twelve joint stock associations in the United States, and the two oldest, which have each had one annual settlement, have declared more than twenty per cent. dividend on their stock. Nor is this strange, when it is considered that nil the unconsumed labor, consisting of improvements made on the domain, as well as money or property received for products,’sold out of the association, constitutes the dividend ; and that economy, unrivaled in the present organization of society, must necessarily ensure a large income. But the doctrine of association still meets with much opposition, on account, probably, of the vagaries of Fanny Wright and company, with which the public mind has become, and, with great propriety, disgusted. This inference is drawn from the fact, that such insinuations have been insultingly cast in the writer’s face. But in the Alphadelphia association, every thing will be done to protect innocence and virtue, that the legislature of Michigan can permit. Families will reside in separate suits of apartments, and virtue and truth inculcated into the minds of all, in early childhood, by able, moral and experienced teachers, who are members already. The system promulgated by Charles Fourier, has no connection with the obscene theory just mentioned. By the provisions of the constitution of our association, which has been laid on the tables of all the honorable gentlemen of both Houses, the right of individual property is supposed to be perfectly secured to every member of the association, in the most available shape it can be put, to be readily transferable; and the bill, which you have drawn up, makes further provision on the subject. No restraint is put upon the employment of any person’s civil liberty, except upon the liberty of doing wrong, and injuring his neighbor ; and the slavery to circumstances is greatly mitigated, by giving every one the choice of his employment, which may be changed every day, at pleasure ; and by securing to all constant employment, and the means to labor with, to the greatest possible advantage. The number of non-producers, and the waste of time for want of suitable conveniences to labor with, as well as in doing by hand what could be done by machinery in. a tenth or twentieth part of the time, will be. indefinitely..diminished. ;, and those who can riot now find profitable employment, or who are, necessarily engaged in unproductive industry, will be set free from the slavery of circumstances, and become prosperous, and consequently independent, virtuous and happy. Who can doubt, for a moment, that associations are pre-eminently calculated to diminish crime and consequent misery? There are already, in the Alphadelphia association, men of science, and more such stand ready to join it, so soon as the Honorable legislature will suffer it to go into active operation. And there can be no doubt that, with its extensive means, it will be able to bring the arts of agriculture and manufactures to a state of perfection hitherto unknown in Michigan. Surely the honorable members of the Senate, and of the House, cannot be indifferent to an object so noble and cheering to every philanthropic mind, cherishing, as they are known to do, the desire of elevating our adopted and beautiful peninsula to the highest pitch of prosperity, happiness and independence.